Fabricators looking to step up their game may want to consider the precision, efficiency and versatility of these advance laser cutting options shown at FABTECH2017. For more FABTECH innovations, watch for next month’s issue. An example of high-tech flexibility is seen in the 3-kW Ensis 3015 RI fiber-laser cutting system from Amada America, Inc., Buena Park, CA. The system blends beam-modulation technology to automatically match material thickness with the power and speed of a rotary index to efficiently transition from flat sheet to tube or pipe cutting. This switch between flat-sheet cutting and tube or pipe cutting is accomplished in less than 2 min., and the system’s ability to process round, square, rectangle, C-channel and angle iron provides users with extreme versatility. The beam-modulation technology allows for a continuous variable beam across every thickness of material without having to change lenses, while ensuring fast throughput. As the material thickness increases, so, too, does the diameter of the laser beam and the width of the cut, enabling easy removal of finished parts. The Platino fiber-laser cutting machine from Prima Power, Arlington Heights, IL, in 2-, 3-, 4- and 6-kW configurations, features a cutting head with integrated adaptive collimator. The adaptive optics automatically manage the focus position and focus radius diameter of the head, equipped with a single focus lens and suitable for all laser-cutting needs. System innovations also include the optical precision control, which diagnoses differences between the real and theoretical positions of the focusing beam, and then shows them on the graphical user interface of the control system. Two knobs located at the front of the cutting head can be used to perform corrections. A capacitive sensor keeps the distance between the nozzle and the sheet constant. The system also is equipped with a nozzle calibration and cleaning kit. After executing a predetermined number of holes or machined parts, the machine automatically cleans the nozzles and performs the sensor-calibration cycle. 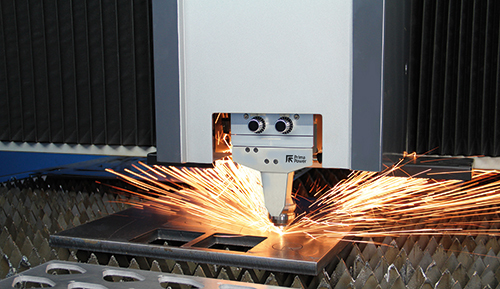 Cut options include Smart Cut for fast processing of thin sheetmetal (to 6 mm thick) for which the nitrogen cutting technology can be used; Max Cut for medium- and high-thickness sheets; and Night Cut for process monitoring with devices, such as the laser-piercing monitor, that control the machining process status and intervene in case of errors—restarting the operation or informing the operator remotely. The ByStar 8- and 10-kW fiber-laser cutting system by Bystronic, Inc., Elgin, IL, was designed from the ground up to meet the demands of users who want to rely fully on fiber-laser technology for cutting their entire range of orders: from stainless steel to 1.180-in. thick, to aluminum and mild steel, to nonferrous metals, such as copper and brass. A triangle-cutting-bridge design provides rigidity and accuracy, enabling high speeds and acceleration while using the XY linear drive. Greater access to the cutting area over the long side of the machine is made possible with the large sliding door that allows users to insert express jobs and residual sheets, even when large-scale jobs are running, by interrupting the job, opening the door and inserting the residual sheet. Another feature is the 22-in. ByVision user interface. The high-definition touchscreen enables users to accomplish cutting preparations with a few clicks or swipes, much like using a smartphone. The TruLaser compact 2030 fiber-laser cutter by Trumpf, Inc., Farmington, CT, is a powerful, space-saving option with as much as 4 kW of power, and requires only 25 by 20 ft. of floor space, including pallet changer. Though small in size, it rapidly cuts material in thicknesses from 0.04 to 0.5 in., while its design exemplifies space-saving efficiency. Components such as the switch cabinet, suction system and laser are built into the machine frame. The machine’s self-guided control meets the needs of newcomers to laser cutting, guiding the operator through setup and programming. Cutting parameters for all materials and sheet thicknesses are stored in the machine prior to delivery, reducing operator training time. 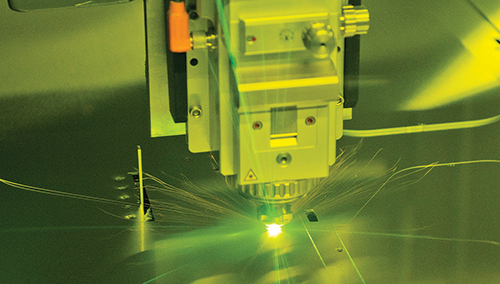 Cutting programs are transferrable to the TruLaser 2030 fiber using a network connection or USB drive. Drawings can be created directly on the machine and converted into cutting programs. And, large windows and LED illumination provide optimal viewing inside of the machine. Several system features save setup time. For example, all materials and sheet thicknesses can be processed with the same cutting unit. Also, the focal position of the laser adjusts automatically to the respective material, and an automatic nozzle changer with space for eight nozzles further reduces setup times. The machine is available with a LiftMaster shuttle for automatic loading and unloading of the machine. The Electra FL 3015 8-kW fiber-laser cutting machine by LVD Strippit, Akron, NY, cuts a range of metals while maintaining 2-G acceleration, resulting in precision cuts in both simple and complex configurations. The system’s cutting head with zoom focus improves piercing times, cutting speeds and cut performance in all material types and thicknesses. Also, the ability to change the focal point allows Electra to pierce 20-mm-thick material in just 2 sec. for significant productivity on fully nested sheets. This means that less heat is generated in the material, making it more efficient to cut small holes. The head also provides stable lead-in after fast piercing when cutting thicker material (greater than ¼ in.) with nitrogen, resulting in an average gain of as much as 15 percent on part-cutting times. Other features of note: The rigidity of the mono-frame construction ensures reliable cutting performance and requires no foundation; an icon-driven 19-in. touchscreen graphical interface guides any level of use; and multiple automated load/unload system options ensure uninterrupted production flow. The Optifplex Nexus 3015 fiber-laser cutter by Mazak Optonics Corp., Elgin, IL, is designed to integrate intelligent setup, monitoring and cutting functions that reduce operator dependency while improving cut quality and productivity. Intelligent setup functions include beam-diameter control, focus detection, auto focus positioning, auto nozzle cleaning and changing, and auto profile calibration. Intelligent monitoring functions include pierce, burn and plasma detection. And, intelligent cutting functions include flash cut and fine power ramping, which optimizes cutting conditions so that dross on the bottom of the worksheet is prevented and quality surface finishes are produced during high-speed cutting of mild steel and thin stainless.